Adi Tantimedh is of Chinese-Thai descent; he grew up in Singapore and London, and now lives in New York. He has written radio plays, television scripts, and Hollywood screenplays, as well graphic novels and commentary about pop culture. He is currently writing a series of novels featuring British-Indian Ravi Chandra Singh, a most unlikely private investigator. 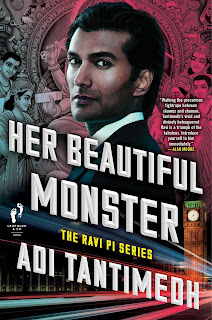 A failed religious scholar, Ravi now works for Golden Sentinels, a gleefully amoral private investigators’ agency. On the job, his attempts to do the right thing often result in mayhem. He has visions of Hindu gods, and thinks he might be going mad, which doesn’t help when it comes to solving crimes. Ravi had his first outing in Her Nightly Embrace. He will soon be appearing again in Her Beautiful Monster, which publishes in January, 2018. This time, Ravi’s adventures take him to Los Angeles, where he is theoretically on holiday. Here he becomes involved in an arms deal, meets Middle Eastern revolutionaries, confronts a raging forest fire, and enters the terrifying shoot-first, check-later agency, Interzone. On the plus side, things are looking good for Ravi and his girlfriend, Julia. And with a bit of luck, they could return to London safe and sound - barring only the nasty people with guns, and the mountainous obstacles in their way. Crime fiction has always been the ideal genre for exploring virtually any idea, and I felt that most private eye fiction has often ignored what private detectives actually do in real life, preferring a romantic fantasy of the hard-drinking, two-fisted gumshoe who solves murders and has a relationship with a femme fatale. I wanted to write about crime and politics beyond the personal stories of murders, perpetrators and victims. I also wanted to portray Britain in a way that very few novels and TV shows do, the way my friends and I have experienced it, so I wanted a non-white protagonist to address how diverse the UK is, and that the world is a lot more morally grey and complicated than the simple black and white morality of a lot of crime fiction. I also wanted to write the last person you would expect to become a private detective: a moral guy who has to do bad things to bad people. An atheist who sees gods. The choice of a British-Indian lead was conscious because I wanted to explore the theme of Britishness in the post-colonial 21st Century. Many Indian- and Pakistani-British people are said to be "more English than the English". 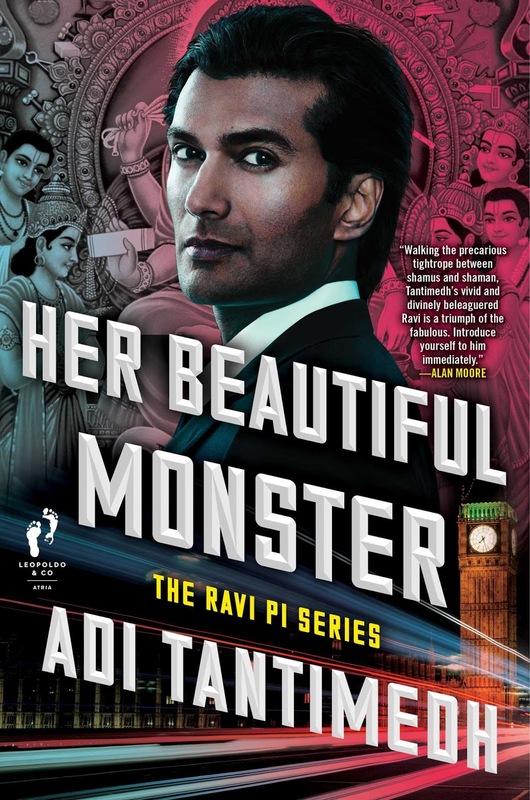 I wanted a quintessential Londoner, and a British-Indian protagonist fits the bill, and I wanted to take Ravi in and out of the UK and abroad to Europe and America to react to the strangeness of the world from the prism of his Britishness. I researched how real private detectives worked. A friend of mine became the target of tabloid journalists trying to dig up dirt, and she discovered that they used private detectives. She found out that many private eyes were ex-cops who used their connections in the police force to get information on people when they're hired. They might bribe former colleagues to get a look at someone's file, get their license numbers and addresses, criminal histories and so on. I discovered how seedy and corrupt private eyes could get. After the British newspaper the News of the World was shut down by a phone-hacking scandal, it was revealed that private eyes had been hacking into the cellphones of people the tabloids wanted to dig up dirt on, such as actors, sports stars and reality show celebrities. I found that many private detectives now use the internet to find out about people, especially by looking up their social media profiles. It wasn't just following people anymore. They can dig up dirt on a person just by looking online. Private detectives can be ex-law enforcement, ex-military and even ex-spies, and they can be hired by intelligence agencies as outsourced contractors to give those agencies deniability. Some of them are also involved in industrial espionage. Private detectives can have a major geopolitical effect on the world other than being hired to follow cheating spouses. It’s a world that’s absurd and darkly comic with various forces rubbing up against each other. This sounds like fantasy, but it’s all based on what really goes on out there. I want the stories to be funny and anti-despair. I want readers to feel they can make sense of the ongoing madness, and use that to navigate the world. Details: Her Beautiful Monster will be available from January 25th, 2018, published by Mulholland Books in paperback. Priced in local currencies.